MEDASSET is an international non-governmental organisation (NGO) founded in 1988, working for the conservation of sea turtles and their habitats throughout the Mediterranean through conservation and scientific research programmes, public awareness, environmental education, and lobbying decision-makers. Visit MEDASSET for more information. Anta is committed to the protection of marine life and an active member of MEDASSET, assisting in the development of environmental education programmes and making presentations on marine biodiversity conservation. 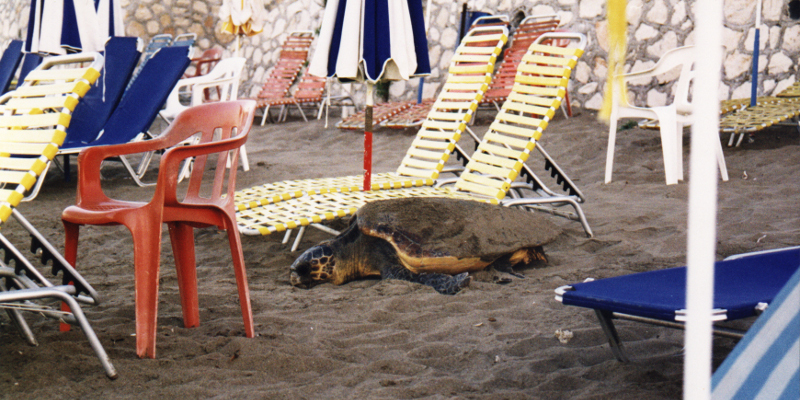 Laganas Bay, Zakynthos: Can turtles and tourism mix? Laganas Bay is situated on the southern section of the island of Zakynthos, Greece and is the host of the most important nesting beaches of the Loggerhead turtle (Caretta caretta) within the Mediterranean. 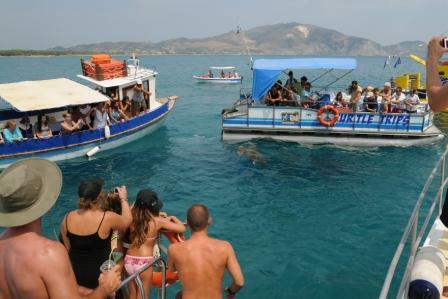 As Zakynthos is one of Greece’s major tourist spots, the beaches around the west of the Bay have become unsuitable for nesting due to tourist disturbance and development. The nesting beaches are facing various threats mostly due to human induced factors. Each year, boats are illegally entering the maritime zones killing several turtles in the bay and, tourists can be still found walking the beaches during the night. Available sand dunes for nesting have significantly reduced over the years. In the evening, noise from bars and lights, frighten and disorientate nesting turtles and hatchlings. A factor that cannot be ignored is the failure by the state, to somehow compensate local landowners affected by conservation legislation and as a result, a strong opposition to conservation efforts has occured. The images that follow are showing vividly the issues described above. What is MEDASSET doing about it? With unrelenting campaigning, MEDASSET has brought attention to the situation in Laganas Bay. MEDASSET has been lobbying for the enforcement of protective legislation in Laganas Bay for the past 25 years, has repeatedly exposed the violations encountered and continues to make annual conservation status assessments of the beaches, which lead to yearly update reports to the European Commission and the Standing Committee of the Convention on the Conservation of European Wildlife and Natural Habitats (Bern Convention). As a result of this, MEDASSET was instrumental in establishing the Zakynthos National Marine Park (ZNMP) on the 1st of December 1999. The NMPZ belongs to the EU Natura 2000 Network and as of July 2006 has been recognized as a Site of Community Importance (SCI) for the Mediterranean bio-geographical region. Plastic in our seas is killing thousands of sea turtles, sea birds and other marine life each year, as they often mistake it for food. 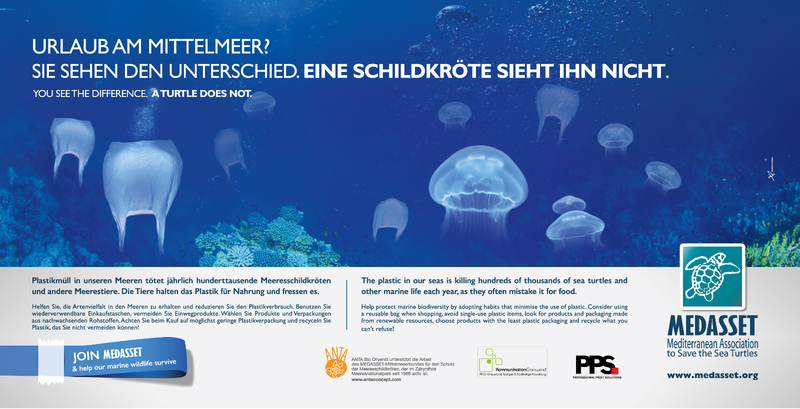 MEDASSET urges everyone to adopt habits that minimise the use of plastic. Consider using a reusable bag when shopping, avoid single-use plastic items, look for products and packaging made from renewable resources, choose products with the least plastic packaging and recycle what you can’t refuse. With the support of many organisations and corporations from around the world, MEDASSET’s campaign “You see the Difference. A Turtle Does Not” has had global exposure and impact. In June 2013, Berlin Tegel Airport also joined forces with MEDASSET and hosted a large Colorama in Terminal A. You can also subscribe to MEDASSET’s newsletter, with the latest news on sea turtle conservation in the Mediterranean, activities and events by clicking here. This entry was posted in and tagged MEDASSET, Meeresschildkröte, tourism on 22. May 2013 by Ada Vlachoustikou.